Shamrock Rovers’ SSE Airtricity League fixture with Bray Wanderers was rescheduled and played last night. SHAMROCK ROVERS’ decision to bring the Premier Division meeting with Bray Wanderers forward proved the right one last night as they claimed a valuable three points. 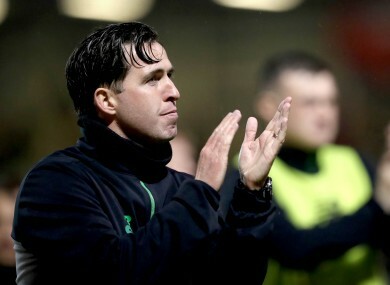 Due to the Hoops’ involvement in the Europa League qualifiers, the original date of 7 July had to be rescheduled and manager Stephen Bradley opted to play the fixture before the mid-season break rather than later in the year. “Me and Stephen [McPhail] had a chat,” Bradley said after the 2-0 win at Tallaght Stadium. “As a player over the last few years, he said he didn’t like catching up on games after Europe. You have to go and try win when everyone else is picking up points around you. The home side were dominant throughout against a leggy Bray side and, on another day, they could have won by five or six. Having lost 4-2 to the Seagulls a month ago and after last week’s 4-1 defeat to Cork City, Bradley was most pleased by his team’s defensive solidity. “When we played them out there I felt we defended in ones and twos and were too spread out,” he added. “We looked liked a team that never played together and that was the most disappointing thing. “Since that night, we have looked a much more solid team — although we’ve lost games here and there. They have the pace of Dylan [Connolly] going in behind, Aaron [Greene] is quick as well and Gary [McCabe] plays in the pocket. He has been on fire this year. While Brandon Miele and Gary Shaw got their names on the scoresheet, Graham Burke pulled the strings in attack and earned praise from his manager. Although they were missing suspended pair David McAllister and Darren Meenan, Rovers looked a well-balanced unit with Lopes and Webster solid at the back, Ronan Finn full of energy in the middle, Trevor Clarke dangerous down the left and Burke, Miele and Shaw all lively. “We always had in the back our minds where different players would be best suited but we hadn’t got them available to do it,” Bradley replied, when asked about how he has settled on this team in recent weeks. Email “'Stephen McPhail said he didn’t like catching up on games after Europe. It looks a good decision'”. Feedback on “'Stephen McPhail said he didn’t like catching up on games after Europe. It looks a good decision'”.